Facing new challenges to a legacy law, the Obama administration on Wednesday set modest expectations for the president's final health care sign-up season. The biggest worry: rising premiums and dwindling choices. Some 13.8 million people are expected to sign up for 2017 coverage, Health and Human Services Secretary Sylvia Burwell said. That would be an increase of a bit less than 9 percent from the 12.7 million who picked plans during open enrollment for this year. This year is shaping up to be the most difficult sign-up season since HealthCare.gov launched in 2013 and the computer system froze up. But technology isn't the issue this time. Premiums are going up by double digits in many communities, and some major insurers have left the program, leaving consumers with fewer choices next year. The administration says taxpayer-provided subsidies designed to rise alongside premiums will cushion most of the pocketbook impact. About 85 percent of customers get financial help. And for those policyholders whose insurer bailed out, the government is automatically matching them to another carrier’s plan. It’s up to the consumer whether or not to accept the match or keep shopping. Officials say returning customers will notice a smoother, more informative website, making it easier to compare plans. Those who are satisfied with their current plans don’t need to do anything; they’ll be automatically renewed. Finally, the administration is ramping up outreach, with a particular goal of enticing younger, healthier people to enroll. Expect pitches on social media platforms, email and television and radio as well as direct mail. And the IRS will play a supporting role with a not-too-subtle nudge. Later this fall, the tax agency will play a supporting role with a not-too-subtle nudge. Later this fall, the tax agency will send letters to people who did not get the minimum coverage required by the health care law. They'll be reminded that going without insurance risks a fine from the IRS, and the basic penalty is now $695. Some independent analysts say even a 9 percent sign-up increase will be a heavy lift. Burwell criticized Republicans for their unyielding opposition, saying “at nearly every turn, we’ve had to overcome partisan attempts to repeal and undermine the law through legislation and litigation.” She called on Congress to cooperate on proposed fixes, such as a government-sponsored “public option” to promote competition. 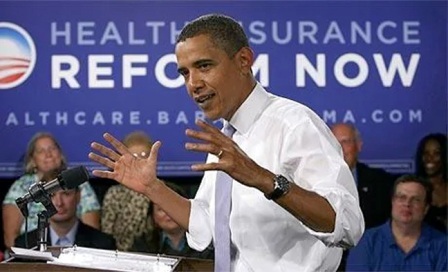 Going into its fourth sign-up season, President Barack Obama's health care law has yet to achieve stability. Enrollment has been lower than initially projected; insurers say patients turned out to be sicker than expected, and a complex internal system to help stabilize premiums did not work as intended, partly because of actions by congressional Republicans. The law makes carrying health insurance a legal obligation for most people, and prohibits insurers for turning away the sick. It offers subsidized private plans to people who don’t have coverage through their jobs, along with a state option to expand Medicaid for low-income people. Largely as a result, the nation’s uninsured rate has dropped below 9 percent, a historically low level. More than 21 million people have gained coverage since the law passed in 2010. The 13.8 million enrollment goal announced Wednesday actually represents an annual high-water mark. The initial sign-up number typically gets winnowed down by dropouts and people who find other coverage. For example, the initial number reached 12.7 million this year. But HHS said Wednesday that enrollment averaged 10.4 million people through the end of June, which works out to attrition of about 18 percent. The administration is hoping for a strong sign-up season to validate the president's signature program, and for a victory by Democrat Hillary Clinton in the presidential election to shut down the Republican campaign for its repeal. Clinton has outlined steps she'd take to build enrollment and sweeten subsidies for consumers. Sign-up season doesn’t start until Nov. 1, but previously window shopping has been available about a week earlier on HealthCare.gov, now used by 39 states. That should be the case again. Depending on availability, consumers will have a new option of picking “Simple Choice” plans. These are plans that have fixed deductibles and standard copayments, making it easier to compare premiums and provider networks. HHS this year changed the way it presents its enrollment goal. Previously, Burwell had focused on the number of customers expected to still be covered at the end of a given year. But the new target reflects initial sign-ups, before attrition. Officials told reporters they did not move the goal posts. “We are using what we believe is a more meaningful metric,” said Kathryn E. Martin, HHS acting assistant secretary for planning and evaluation.